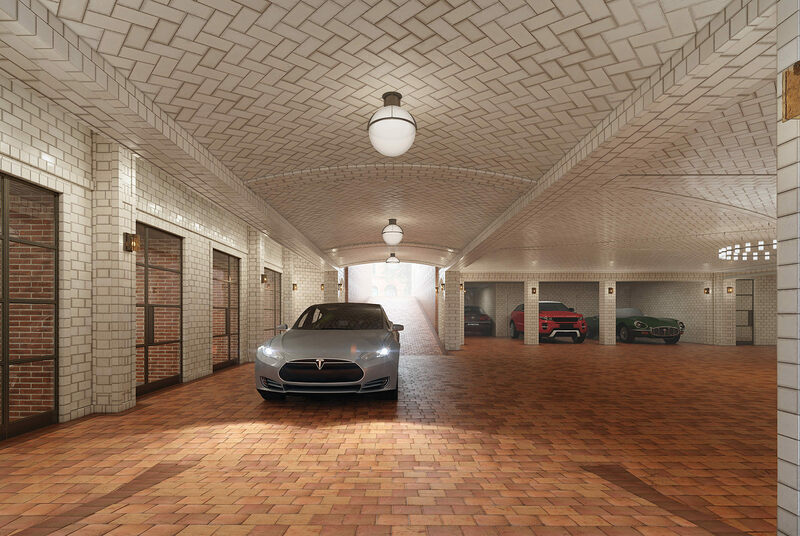 Drive through landmarked, ornamental wrought iron gates down to an extraordinary vaulted, lower level lobby with period tiled walls, floors, and ceilings. Unload passengers or packages in a secure, private space where your valet is ready to drive your automobile for you to adjacent Tribeca parking. 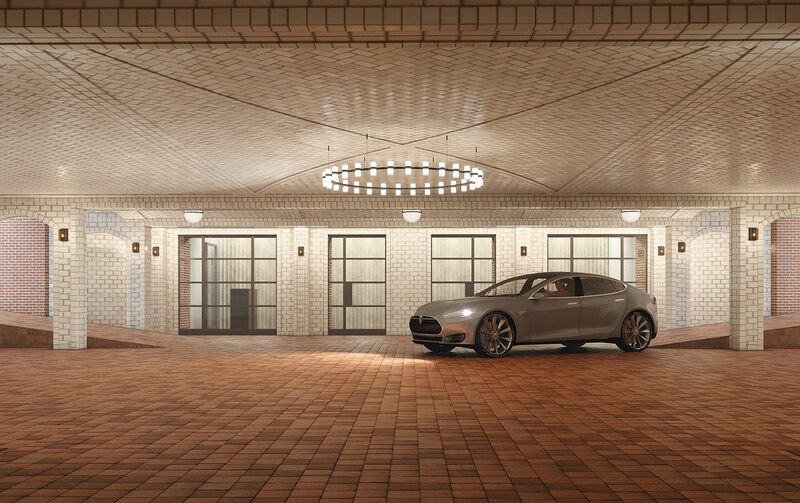 Or, purchase one of 15 private on-site parking spaces, each fully equipped with its own electric charging station. Cloistered by glass and brick, an inspired garden, flooded with natural light and lush with plantings, stands hidden in the heart of Tribeca, at the center of 443 Greenwich. A secret garden, removed from the public noise of the city. A 75-foot lap pool offers a sybaritic, spa-like experience with travertine marble walls, 11-foot ceilings, soft lighting, and private alcoves for afterswim relaxation. A 5000 square-foot roof deck can be accessed by elevator from the lobby. Meticulously landscaped with trellised sections, it offers quiet areas as well as active areas for children, showers for sun bathers and a wet bar. Personal possessions may be kept in secure 100+ square-foot storage rooms in the lower level, available for purchase. For residents, a meticulously designed fitness center, staffed and operated by The Wright Fit, an internationally recognized innovator in fitness services. Two private studios are available for yoga or private training sessions. In addition to wine storage built into every residence, there is a climate-controlled wine cellar on the lower level with storage for bottles you may want to save for special occasions, or simply to age. Individual locked wine cages may be purchased. Relax in the full-size Hammam / steam room, adjacent to well-appointed men’s and women’s locker rooms. You can safely store your bicycle on racks in the lower level, with convenient street access via the private garage ramp. Adjacent to the fitness center. Work out while your children stay happily occupied in the adjacent children’s playroom. 443 Greenwich has a full-service lobby with a 24-hour concierge and doorman, a live-in building manager and a full complement of porters and handymen.